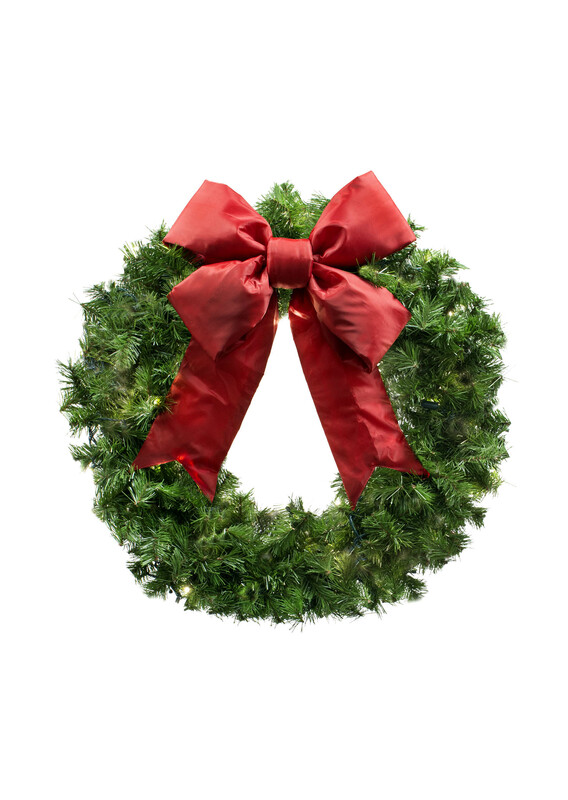 Are you looking for a durable, high quality wreath that will withstand the harsh commercial environment? We at Downtown Decorations have a long history of providing the highest quality products in the industry, in addition to providing extensive, individualized support. Our customizable commercial Christmas wreaths are well suited for retail outlets, banks, offices, city halls and mainstreets, to name only a few. Wherever you may want to add a splash of color and holiday essence, our products are an ideal solution. Since the very beginning, we have focused on the quality of our products. We make sure that all of our products are constructed to last for several years without any problems; thus, you won’t be forced to purchase a new product every holiday season. Aside from our large outdoor wreaths, we also offer other options. Here’s what you can look forward to when you purchase a wreath from us. As mentioned earlier, all of our products are built to last for several years. The materials we use are fire and UV resistant. They’re easy to clean and maintain, thereby allowing them to appear green and bright at all times. Our wreaths are also very resilient and are not damaged easily, allowing for both interior and exterior use. 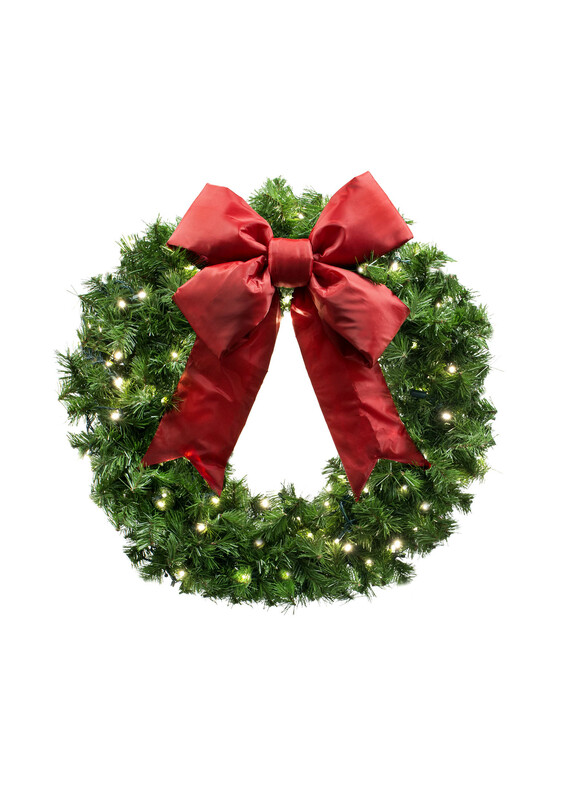 Our outdoor lighted wreath is one of our most popular products and adorns many properties across the United States; set on galvanized wire, these are lightweight and yet very strong. We realize that wreaths are often unexciting, often times featuring the same colors and traditional design. However, we have created a customization guide for wreath design, allowing you to create a wreath that is truly your own. With the option to design one that compliments your property’s style, your creativity is the limit! For example, if you want a diamond or square shaped outdoor lighted wreath, adorned with a whimsical array of ornaments, you can very well order it! Our wreaths are available in sizes from 3’ to 12’. Downtown Decorations’ standard foliage is a Mountain Pine foliage, which, despite the generic design, remains popular due to its realistic appearance. This foliage mix is comprised of dark and light green garland, with a brown core. However, we do offer several other options, including but not limited to colored and metallic, mixed foliage, boxwood, holly, and long needle options. A seemingly endless assortment of lighting and ornamentation options are also available, depending on your preference. Every large outdoor wreath you choose can be completely unique to you. If you want to know more about Downtown Decorations’products and services, or wish to get a quote, please feel free to contact us. Just fill in this contact us form and we’ll get back to you as soon as possible. You can also call us at our Toll Free number: 877.369.6223 or dial 315.432.0646. We look forward to working with you soon!